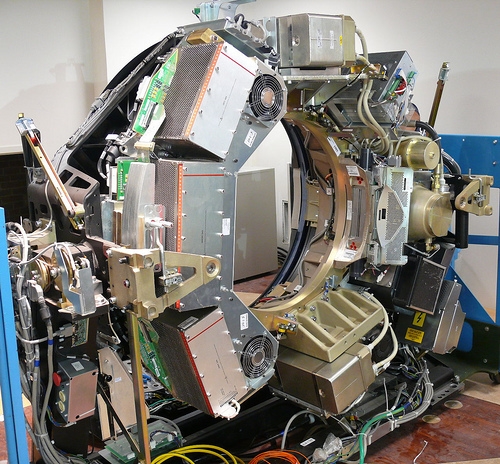 Improved Technologies Lead to Challenging Tasks for CT Scanner X-Ray Tubes. The most current CT scanning techniques place a high heat load on the CT scanner x-ray tube, due to the need for high tube current values to provide enough photons in the image, when scanning with fast rotations and fine slices. Increasing rates of patient obesity mean that the size of the average patient is an added burden on the x-ray tube, as higher tube currents need to be used in order to generate enough photons to give reasonable image quality. To scan a sufficiently long length, while avoiding overheating, CT scanner x-ray tubes have generally been developed to have high anode heat capacities and high cooling rates. Some designs have low anode heat capacities, but very high cooling rates to compensate. These two specifications of the CT scanners x-ray tubes: heat capacity and cooling rate need to be jointly considered in order to assess the overall heat load capability. Examples of designs of CT scanner x-ray tubes that improve cooling rates are: spiral-groove bearings with liquid metal lubrication, and anodes with direct oil cooling. X-Rays and the Relationship to Produced Heat. To produce x-ray, relatively large amounts of electrical energy must be transferred to the x-ray tube. Only a small fraction of the energy deposited in the CT scanner x-ray tube is converted into x-rays; most appears in the form of heat. This places a limitation on the use of CT scanner x-ray tubes. If excessive heat is produced in the CT scanner x-ray tube, the temperature will rise above critical values, and the CT scanner x-ray tube can be damaged. This damage can be in the form of a melted anode or ruptured tube housing. In order to prevent this damage, the CT scanner operator must be aware of the quantity of heat produced and its relationship to the heat capacity of the CT scanner x-ray tube. The heat produced during x-ray production can be a limiting factor in CT scanning, especially with spiral scanning of relatively large anatomical regions. One of the major challenges in developing CT scanner x-ray tubes for contemporary, high-performance CT scanners is to provide design features to accommodate the high levels of heat produced. Heat is produced in the focal spot area on the rotating anode of the CT scanner x-ray tubes by the bombarding electrons from the cathode. Since only a small fraction of the electronic energy is converted in x-radiation, it can be ignored in heat calculations. We will assume all of the electron energy is converted into heat. In order to evaluate the problem of the CT scanner x-ray tube heating, it is necessary to understand the relationship of three physical quantities: heat, temperature and heat capacity. Heat is a form of energy and can be expressed in energy units. Relationships Between Heat, Temperature and Heat Capacity. Temperature is the physical quantity associated with an object that indicates its relative heat content. Temperature is specified in units of degrees. Physical changes, such as melting, are directly related to an object’s temperature rather than its heat content. As for any given object, the relationship between temperature and heat content of the anode of the CT scanner x-ray tube involves a third quantity: heat capacity, which is characteristic of the anode. The heat capacity of the CT scanner x-ray tube is more or less proportional to its size or mass and a characteristic of the material known as the specific heat. As heat is added to an object, the temperature increases in proportion to the amount of heat added. When a given amount of heat is added, the temperature increase is inversely proportional to the anode of the CT scanner x-ray tube heat capacity. In an anode with a large heat capacity, the temperature rise is smaller than in one with a small heat capacity. In other words, the temperature of the anode is determined by the relationship between its heat content and its heat capacity. The heat is produced in the focal spot on the anode. From this area, the heat moves by conduction throughout the anode body and by radiation to the tube housing; heat is also transferred, by radiation, from the anode body to the tube housing. Heat is removed from the tube housing by transfer to the surrounding cooling medium. When the tube is in operation, heat generally flows into and out of the three areas mentioned above. Damage can occur if the heat content of any area exceeds its maximum heat capacity. X-Ray Tubes in Multislice CT Scanners. Unlike most other technological factors, CT scanner x-ray tubes on multislice CT scanners positively benefit, since the load to the tube is reduced by the use of a multislice detector. In this aspect, the CT scanner x-ray tube for multislice CT does not necessarily have to be a larger one. However, the situation may be totally different when faster rotation is used in combination with a multislice detector system. Because of these challenging specifications, entirely new tube designs are required for the purposes of precision, safety and product life. The range of the heat capacity of modern multislice CT scanner x-ray tubes is from several mega-heat-units up to 8 mega-heat-units. Heat dissipation rate of the largest CT scanner x-ray tubes peaks at over 2000 kilo-heat-units per minute. The Future of CT Scanner X-Ray Tubes. The future demands of computed tomography imaging, regarding the x-ray source, can be summed as follows: increased scan power, shorter rotation times, shorter cool-down times and smaller focal spots, all highly beneficial to the patient and the physician in diagnosis and treatment.